All vehicles must have a current ITV certificate, unless exempt because they are new. Be aware that if you own a dual purpose vehicle, (e.g. Renault Kangoo, Citroen Berlingo, etc.) they require the first test after 2 years from new. You can make an ITV appointment online. (CLICK HERE) This is the link to the official website, there are other fake websites, so beware! What is checked at the ITV testing station? Vehicle documentation against chassis number of vehicle to ensure it is the correct vehicle. General condition and appearance of vehicle, both inside and outside. Door and window operation, door locks, seat belt condition and operation. Windscreen condition. Windscreen washers and wipers. Rear view mirrors. All lights, indicators, fog, reversing, headlamp beam accuracy. Horn. Rolling road brake test, front and rear service brakes, then handbrake. On a steel moveable plate the car is checked underneath for general condition, exhaust, tyres and wheels, mechanical fitness of steering, suspension joints and shock absorbers using physical force. What documentation will the ITV station require? 1. 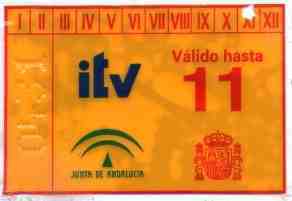 The vehicle ITV green card. Testing stations in some provinces ask to see a current insurance certificate (I have never known this happen in Almería) and in Cataluña the identification of the person doing the test. 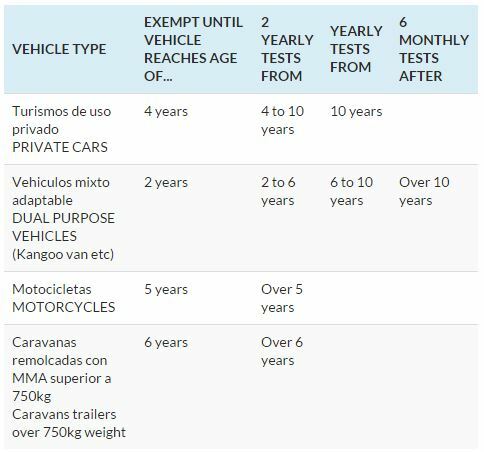 Testing stations have access to the Spanish vehicle insurance database. The table below sets out the ITV test intervals for the most common types of vehicles owned by ex-pats in Spain. (Cars, Motorcycles, Vans).